run and the junior races on Saturday. I signed up for this about 6 months ago when I didn’t get a ballot place in the Great North Run. I decided this was the perfect alternative, although I am now also doing the GNR by gaining a charity place! 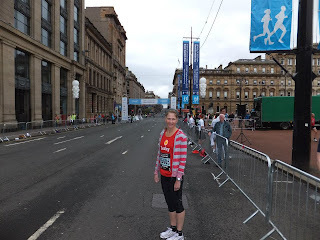 Anyway – it felt like a bit of a milestone race for me as instead of it being an ‘A’ race, I was going in prepared with three completed half marathons behind me and 5 weeks to go ‘til my first marathon. 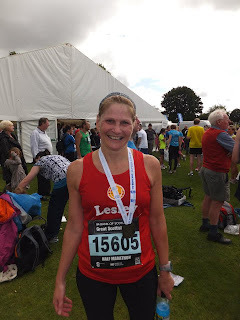 I had decided to treat it as a dress rehearsal for the marathon – I would wear the outfit I was going to wear at Chester, take the nutrition I plan on eating and run the pace I plan on running. When I originally booked this race I had in my head that I wanted to run a good, strong run but wasn’t fussed about a personal best – in fact my main priority was crossing the finish line in zero pain, with loads still left in the tank. BUT as the time approached a PB was all I could focus on! I am in a face book group called “Run for Fun” (RFF) which is a very supportive group full of runners of varying ages and abilities encouraging each other! There was a lot of these members also running in the Great Scottish Run and we had swapped mobile numbers and were planning on meeting up sometime during the event! It would be nice to put faces to names! We got the 14.08 train up to Glasgow arriving at The Central Station at 16.01 on Saturday afternoon and stayed in the Travelodge Glasgow Central Hotel. When I booked this hotel my main concern was for it to be a) cheap and b) close to the start line! I got a super good deal on this hotel (considering it was for such a busy weekend in Glasgow!) and it was only about a 10 minute walk to the start line. So a good result ... if you are Harry Potter and accustomed to living in a room under the stairs that is! However, saying that although the room was extremely small it was clean ... and no spiders ! After checking-in we went for a wander to see if there was any restaurants close by for our evening meal. Luckily, as it was cold and raining we didn’t have far to go to find a Pizza Express and booked a table for 7.30, after which we went for a Cappuccino in Costa! I was fascinated and amazed by some of the Glaswegian accents – some are very fast talkers and difficult to understand, I pity any foreigners visiting! I had planned to have a pasta dish in Pizza Express (to carb up!) along with a soft drink – after all I had a race to run in the morning. Once sat down and presented with the menu I found myself ordering Mozzarella Garlic bread, followed by a large Pizza and an accompanying glass of Pinot Grigio ... and THEN to add insult to injury I proceeded to demolish a chocolate dessert, served with strawberries and ice-cream! Perhaps not the best pre-race meal but it was good! I had a bad night’s sleep, due to a combination of things I think a) being stuffed full of food b) sleeping on an extremely soft and squeaky bed! Turning over without waking the whole hotel was a fete in itself! C) Noisy party revellers going past the hotel waking me up on numerous occasions! D) nerves/excitement/anticipation! I woke up at 8am feeling slightly stiff and not at my best! 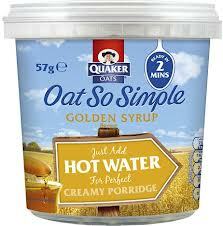 Breakfast was an instant Porridge Pot (which I had had the foresight to bring with me from home!) so that I didn’t need to exercise any restraint in turning down a full English Scottish breakfast! If we had gone down to the restaurant I would have caved in and I knew it was for the best this way! I got dressed in my kit, secured my number on my vest and organised the gels I was going to take with me. I had to pack up all my belongings and organise the bags so I had clothes to change into after the race easy to hand (we were heading to catch the train soon after I finished and I didn’t fancy sitting in sweaty running gear for 2 hours - also I didn’t think my fellow rail users would appreciate it either!) I was eventually organised, packed and ready for the off! The Half Marathon wasn’t starting until 11am and prior to this there was a 10K race. We had been advised not to turn up at the starting point until after 10am when all the 10K-ers would have gone. We left the hotel and wandered through a deserted central Glasgow. I was worrying that I had the wrong date – where was everyone?! 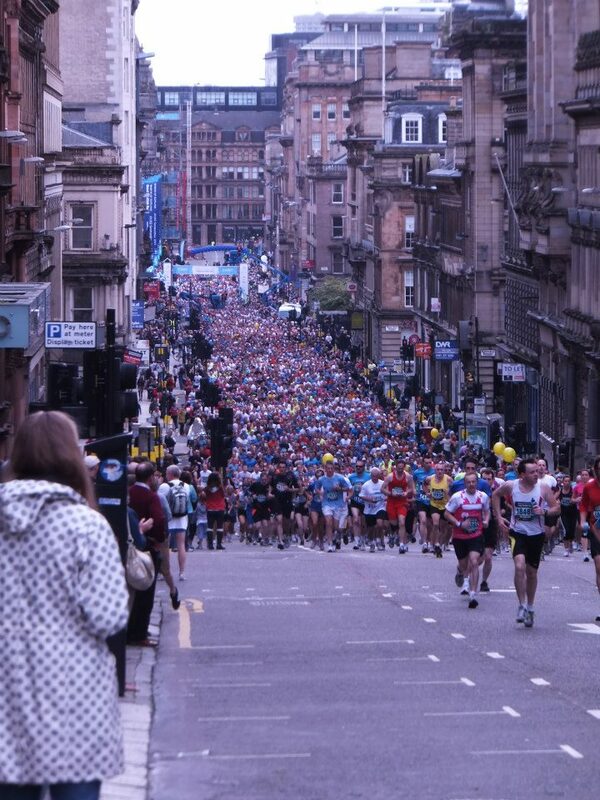 This was just after 10am but then as we rounded a corner at the top of Vincent Street we saw the last waves of the 10k runners go past climbing the hill (some were walking at this point!) ! I was looking out for fellow Run for Fun friends, and soon spotted Sharon going past, even though there was 14,000 10K runners! I gave her a shout of encouragement and was pleased to see her turn and that she had actually heard me! I was amazed at the audacity of the organisers planning the route to put a whopping big hill right after the start line! 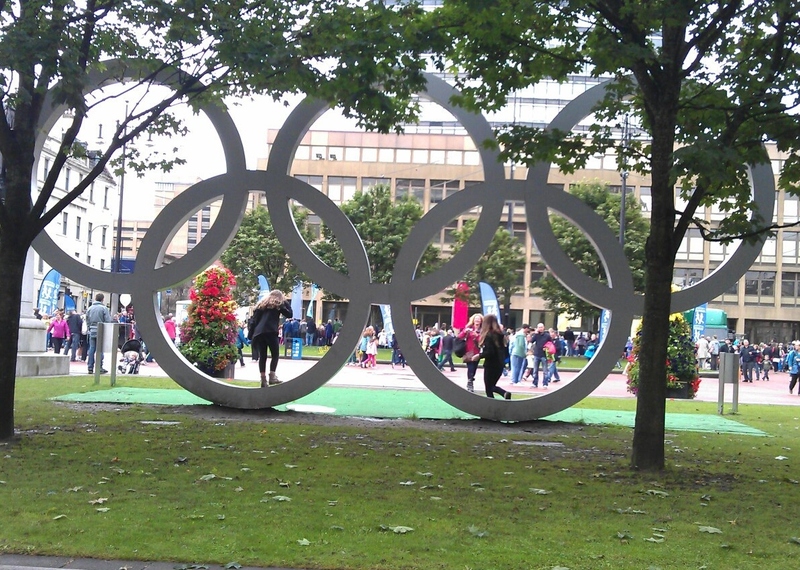 We stood and watched until the road was clear and we could proceed to the starting point in George Square! Once in George square we located my “blue wave” gathering point and settled ourselves on a nearby wall to soak up the atmosphere whilst waiting for the race to start! So many runners and their families were roaming around but another Run for Fun-er, Sandra, soon spotted me and came over for a chat. I soon needed to go for a nervous wee and although there was hundred’s of toilets there were thousands of runners ... and as usual at these events a huge queue. I started the usual random chit chat with the women in front and behind in the queue and tried not to think what lay ahead! Despite having completed three half marathons and a 20 mile run recently as part of my marathon training, nerves and fear were still beginning to creep in! It was soon time to make my way to my blue starting point. I took this opportunity to eat a banana and take an energy gel. There were four different coloured “waves” and being in blue meant we were the second wave to set off (did that mean they expected me to run fast?!). As I was milling around in this area another Run for Fun-er Roz came and introduced herself! If you are wondering how everyone recognised me it was because I had a RFF Vest top on with my name splattered over the front! It was nice to have someone friendly to chat to as we waited for the first wave to set off and for it to be our turn! I said good bye to my husband and he made his way to a spectator’s spot – at the top of the hill, before going back to the hotel to check out, collect our belongings and making his way to the finish with the main aim of getting there before me! Waiting in Blue wave - nervously! There were several pace-setters mingling in our section with a balloon attached to their T shirts saying either 1:50 or 1:55. I decided to stay close to one with 1:50 on. (Brave or stupid?!). Eventually our wave was being walked towards the start line – it was our turn and we were OFF … off up the lovely uphill start. The route goes West out of the city centre before looping back and crossing the Clyde via the Kingston Bridge. These were major roads which were closed – it felt strange to be running on motorway slip roads and dual carriages! It was very crowded and I struggled to maintain pace. Runners were stopping, cutting in front, barging past ... generally being irritating! I wasn’t listening to any music today and just soaked in the atmosphere and enjoyed a steady pace following my balloon and settled in for the long haul. 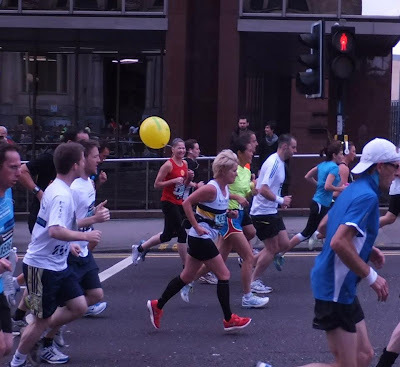 You could see runners far ahead of you arching over the bridges, and I still had my balloon in sight ... until the first water station. I grabbed a bottle turned around and my balloon was gone! I hadn’t appreciated they wouldn’t stop or slow to refuel – I thought even “good” runners needed to hydrate! Anyhow, I soon latched on to a 1:55 balloon and again settled into this pace. I held on to my bottle as they were little hand held ones so no trouble at all to carry. The course meandered through some residential areas where there were a few people lining the streets cheering us on. There were also people who had a stand with orange slices at mile 4 – I decided against grabbing one of these as I didn’t fancy sticky fingers for the remaining run, then we went on to tackle Paisley Road West: a slow gradual hill! 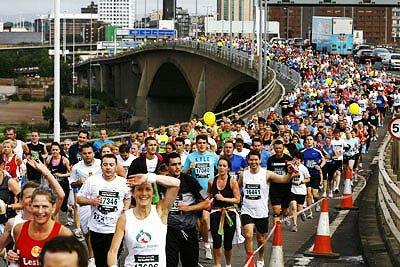 The next stage of the course entered Bellahouston Park. The number of spectators started to increase. It made such a difference having people smiling at you and cheering you on. There was another water station and on slowing to grab another bottle I lost my 1:55 balloon – it looked like I was on my own! I took this opportunity to have another energy gel whilst I had water to wash it down with! After another couple of miles the route went into Pollock Country Park, and another bit of a climb before a downhill section! Despite there being no spectators in this part of the course there were still things to look at – drummers, steel bands, jazz groups and bagpipers all crept up at various points which were great to listen to. As we came out of Pollock Park I was sweating cobs although the sky was overcast! However ... There were Sikhs and Muslims running in hijabs and full body coverage who must have been ROASTING! 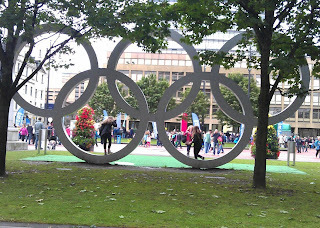 We were then making our way back towards Glasgow Green and the finish – the remaining 3 miles just seemed to loom ahead! I tried to convince myself it wasn’t far to go by breaking it down into familiar runs at home ... it’s just like running to Natland etc. The closer we got to the Green the more crowds there were – I felt quite important running through them! There was a car dealership with a PA system set up and it made me smile that they were playing Eye of the Tiger Surviver! Just a man woman and his her will to survive! I was going to survive! It was at this point I decided I had had enough but took a final gel, and tried to pick up my pace! One final push and I would be there but there was nothing left in my legs! The last mile seemed to go on forever! The crowds were two or three deep and people were calling out my name cheering me on. People all around me were walking, huffing, panting and running like the walking dead… I was determined I was going to keep running whatever! It’s very difficult to keep running with so many walkers obstructing your path when you don’t have the energy to swerve, duck and dive! Eventually I was on the home straight, but it wasn’t until I rounded a corner that I could see the delightful finish point! 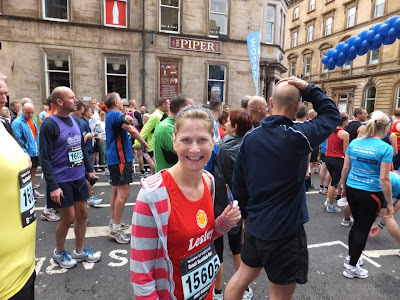 As I approached I heard the man with the tannoy say “... and here comes Lesley” so I felt like I had to look a little enthusiastic and like I was having fun not hating every second! I plastered a fake smile on my face, gritted my teeth and headed for the line! I was so grateful to finish! 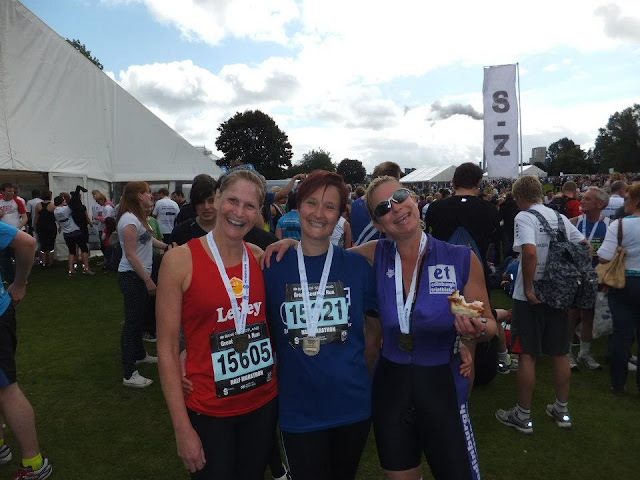 I found this race one of my toughest half marathons to date – I’m not sure whether I set off too fast following the pacer or if it’s just that my legs weren’t fresh and ready to run after running a half marathon just 7 days before! After the finish line there was quite a walk to collect a medal and goodie bag and then a photographer taking a photo of you with your medal! I had a fixed grimace on my face in this one! The goodie bag contained a bottle of water, an energy drink, a banana, a razor (had they seen my legs? ), moisturiser and some energy tablets! One of the better ones! I didn’t quite manage my target time of a sub 1:57 , but I’m trying not to be too disappointed. The unprecedented numbers taking part meant my particular “wave” was very crowded so I couldn’t get into my rhythm (that's my excuse and I'm keeping to it!). I tried to follow a 1:50 pacer initially and I think I pushed myself too hard too early. In the end I finished it in 2:02:15 , still the fastest time I have completed the Great Scottish Run in – yeah OK it’s the ONLY time I have completed it! I made my way slowly from the finish line to the family reunion area where I had arranged to meet my husband and fellow Run for fun-ers in zone “R” for Run! It was very congested in this area but I managed to locate my husband and a couple of RFF-ers! Unfortunately, we didn’t have long to hang around to meet the others and I was soon in the changing tent trying to peel wet horrible clothes off my aching limbs, whilst tip-toeing around on damp muddy grass in my bare feet (not the best changing facilities in the world!)!! I saw another RFF-er, Nikki, at this point too (God they get everywhere!). I then had a good 20 minute walk to the station to catch our train home at 2.35pm. Luckily we had just enough time to pop into M & S to buy a sandwich and crisps for the journey home. It was a busy train ... but thankfully we had seats reserved! There’s no way I could have stood! Never had double sided bling before! Now which side do I display? So all in all a good learning curve of what to do and not to do in the future! You can view my garmin map of the race here! and see the full results here!